Kevin Weldon AM started soon after the elections with the set up of the Marks of the International Life Saving Federation and created the logo in black and white and in colours that is still in use. 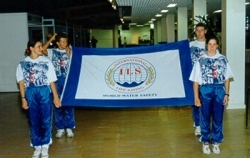 The circles, water and lines and the words World Water Safety are printed in process blue. The letters “ILS” and “INTERNATIONAL LIFE SAVING” are printed in warm red. The laces are printed in gold; it is allowed that the surroundings of the laces are printed in process blue. The logo was given in 1995 to the design bureau Studio Montage (USA) and Bert Vander Marck created the 3 dimensional logo still in use. Member Organisations or media requiring a higher resolution version of the ILS logo are kindly requested to contact the ILS Headquarters. The ILS Flag was created in 1994 and was first shown to the General Assembly in Cardiff in 1994. Four Flag carriers were selected and entered the creation ceremony with the ILS Flag. The flag was received with a standing ovation by the ILS members present at the ceremony.